You’ve probably seen a classic kayak a hundred times but there’s one you don’t see often – Crystal Kayak. We don’t know how to begin with the advantages of using a kayak. You can use it for instance for fishing, or to get fit. You can even opt to replace your tender on your sailing yacht. Crystal Kayak is made from a lightweight and completely transparent materials- advanced polymer hull and corrosion-resistant hardware. Thanks to its collapsible design you can easily transport and store it. The frame, seats and chamber are removable. 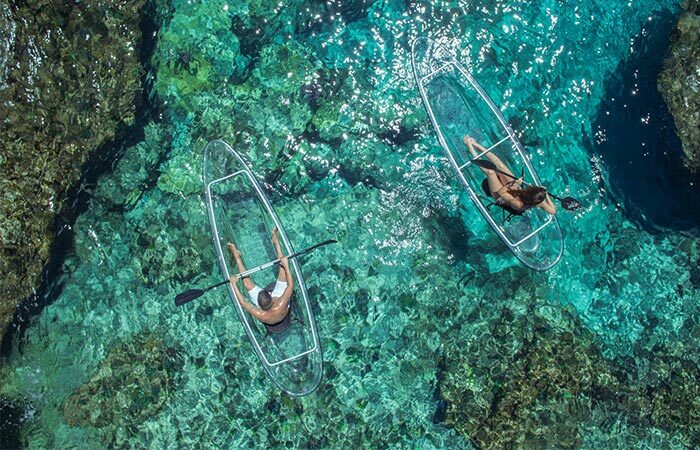 This kayak is transparent and lightweight. Included with the kayak, you’ll get paddles and you can choose between basic or deluxe package. Basic includes a painted aluminum body while the deluxe paddles are made from fiberglass. There’s one more option- you can choose to get it pre-assembled or assemble it yourself. To do so, it will take you up to 60 minutes the first time but once you master the process, it will go down to 20. Of course, you’ll receive assembly instructions but they are available online as well. With it, you’ll be able to see what’s under you. 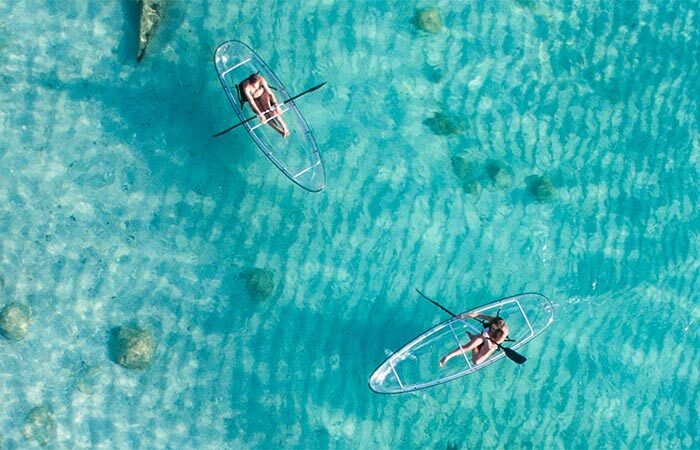 Another great feature of this transparent and quite spacious kayak* is the UV protective coating, with the proprietary UV absorption lacquer layer being 40 microns thick and having a concentration level at 6%. Other information you can find useful: the frame is made from anodized aluminum, kayak weighs 48 lbs and has a weight capacity of 425 lbs. As for its dimensions, it measures 11.1 x 33.5 x 11 inches. On their website, you can get all sort of accessories like spare parts, extra seats, a trolley to easily transport it and even a cleaning set. * To be fair though although it looks good we’re not quite sure about its stability and pointing ability in windier and slightly choppy conditions.